In June 2015, Margaret Magnarelli took the helm as managing editor of Monster, one of the most-visited career websites in the world. She was tasked with reestablishing the brand’s voice and reconnecting with its core audience of job seekers. To make that happen, she shifted resources and budget from outsourced agency relationships to in-house talent, and grew her staff from three to seven. Margaret is also one of CMI’s finalists for Content Marketer of the Year. 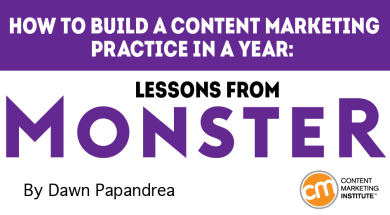 Margaret shares the top lessons she learned in her first year with Monster. These great ideas can work for anyone new to an organization or trying to build a new content marketing practice at an established company. Covering something like the ever-changing labor market requires your content marketing strategy to be adaptable. In today’s job climate, for example, there’s a talent gap in certain sectors like technology and healthcare, says Margaret. For these industries, “There are more jobs available than people applying for those jobs, so it’s very hard for employers to find talent. We have to engage with audiences in those industries where the talent gap is the tightest,” she explains. Of course, that example is only one small segment of the job-seeker audience. Margaret knew that Monster needed content broad enough to appeal to anyone looking for a job, as well as passive job seekers who are employed. At the same time, the site had to cater to groups segmented based on level of experience (i.e., new graduates, entry level, executive) and by industry. How – straightforward utility content used for search purposes and to fuel the company’s newsletters. “It’s the bread and butter of what we do. The stories come down to ‘how do I find a job,’ but we have to do it fresher and newer and different every time,” she says. This pillar’s editor also works with an SEO agency (360i) to update and refresh the huge inventory of existing content on the site to boost rankings or have it qualify for Google’s quick-answers feature. Now – thought leadership, focusing on news- and data-driven stories. Its editor and two staff writers focus on creating daily content. “The Now pillar shows that Monster has its finger on the pulse; that we know what’s happening right now in every aspect of the labor market,” says Margaret. Writers scan headlines and look at what’s trending to see what they should be covering that relates to the job market. This team also uses Monster data and research to create articles about the companies, industries, and cities where hiring is happening. Monster’s syndication partners, including Fast Company and Fortune.com, tend to favor this sort of content, too. Wow – where the fun happens. These pieces are meant to entertain and engage and are created with social sharing in mind. From infographics to quizzes, as well as a more recent push for video content, the Wow editor works closely with social and design teams to develop assets with viral-like qualities. As for how it all comes together, Margaret runs a twice-weekly meeting with the whole team to figure out what should run, with the goal of delivering a diversified mix of the above pillars to satisfy newsletter needs, social media demand, PR campaigns, the news cycle, and reader interest. All told, her team churns out about 20 original pieces per week that are published on the Monster site. Everything published is promoted via Monster’s social channels, and then made available to syndication partners so regular discussions around distribution happen as well. Although Margaret’s focus is on educating the job-seeker audience, she understands that Monster’s clients are the employers who list their jobs on the site. “The best content is what serves both the gods: the utility our consumers want and something that gets our company’s B2B message out.” As such, when there’s an opportunity to both attract job seekers and spotlight top-notch employer brands, it’s a win-win. One good example of content that served the dual purpose of engaging the audience and satisfying Monster’s clients was the Best Companies for Veterans content package they created to run near Veterans Day last year. “We took a panel of experts in the field and had them nominate 100 companies,” she says. Her team reached out to those companies and asked for a few data points that showcased their veteran-hiring practices. They then sorted that information and came up with a list of best hiring practices, and the companies that best exemplified them. 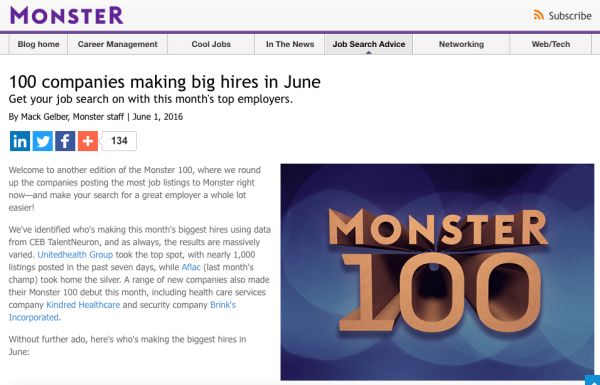 Another example is the Monster 100, which is a list of the top companies hiring on Monster each month by number of jobs. Not only is it popular with their audience and a new piece of content each month, but it is also resulting in great conversions to job searches and applications. Creating this data from scratch and the related content packages that followed proved to be a successful team effort, she says. “This did very well for us. Companies were sharing it. It increased the feelings of positivity around the brand. And it serviced the audience of veterans looking for jobs, so it was useful to our audience,” she says. Find out how you can help others. Often, departmental goals overlap, so by identifying common ground, you can pool your efforts. For example, Margaret saw great value in bringing the SEO director into her trust circle. “Utilizing his resources to create content for my team was a no-brainer. It works for both of us,” she says. Be an internal content marketer. Getting people inside the organization to understand what it is you do is key. “I make sure I’m speaking at every cross-team meeting. I’m getting into the employee newsletter,” Margaret says. Collaborate with other teams on fun projects. Margaret says she’s fortunate that her team operates under the communications umbrella because it creates a natural relationship with PR and social. For instance, an infographic titled, A Superhero’s Guide to Career Victory, which was timed to run to the release of the movie, Captain America: Civil War, was a true collaboration. A designer and copywriter within the UX team created it. Then PR helped garner a lot of media coverage for the guide, including a pickup on blackenterprise.com, among others. Afterward, Margaret ran the guide on the site with an accompanying article, and within the newsletter. And Monster’s video producer created a video to push out via a paid-media campaign. Although Margaret isn’t tasked with achieving any specific KPIs, she holds herself accountable to business objectives. “I make sure I know what the CMO’s goals are. We have to prove that this is working, and part of that is showing that we are contributing to the business,” she says. However, that means accepting and explaining that some of her team’s work will not have immediate or clearly identifiable results. “There’s no way to show that some people are looking at our content and then filing away Monster in their brain as a place to go when they’re looking for a job,” she says. Page views – “That tells me if people are engaging with the content and coming to the pages. Whether they’re coming through social, newsletters, our syndication partners, or direct on-site traffic, it’s the first thing I look at from the brand-building perspective,” Margaret says. Job views/job searches from the content pages – “Some of our pages more directly link to job searches within the stories,” she says. (One example of this is the Monster 100 post mentioned above that links to the job descriptions for these companies.) Tracking people who come to the site through content and begin job search activity is the kind of result that Margaret loves to show to management. Job searches initiated from content pages on the site were up 29% in the first quarter of 2016 compared to the first quarter of 2015. Applications and resume uploads – Margaret says it’s more difficult to show content’s direct influence on these important metrics since there’s not always a straight line between someone looking for a job and applying for one. Still, watching these stats grow helps demonstrate that content is valuable in driving the right kinds of leads, she says. One metric that may seem glaringly absent from this list is social shares. While Margaret cares about this number, she doesn’t prioritize it because the audience often hesitates to share content. “People may like the articles we publish but don’t want to let on that they were spending time on a job site. They might not want their bosses/friends to know,” says Margaret, admitting this isn’t a challenge she initially anticipated. Margaret has gotten into a good rhythm as far as content production goes, but there’s one learning curve she’s still navigating. “I did not understand how much of the content experience is about UX and site design,” she says. That’s why the next six months will be all about site refinement and improving conversions via content. And in the next year, “We want to make sure CTAs are dynamic. And, I’d love to see us have a more personalized content experience where you come to the site and it knows your industry and what phase of the job search you’re in,” Margaret says. In the meantime, the team keeps working to ensure that they are “hired” as the job-search solution of choice by both content-craving job seekers and employers. See how more of the best brands on earth are conquering their content marketing challenges. Download our e-book: Get Inspired: 75 (More) Content Marketing Examples. Editor’s note: A special thanks to Ardath Albee who scoured the planet looking for the best of the best content marketers. She was instrumental in helping us find our 2016 Content Marketer of the Year finalists.